Co-sponsored by S-K Fuels and Oquossoc Grocery. 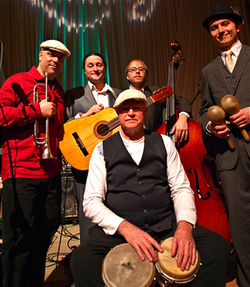 Primo Cubano will perform at the RFA Lakeside Theater offering their own style of Salsa, and during intermission, concert goers will enjoy “A Taste of Cuba” – delicious hors d’oeuvres and snacks with a Cuban flavor. Primo Cubano plays traditional Cuban dance music dating back to the turn of the 20th Century. Son is the most popular style to come out of Cuba and is the primary contributor to the blend of Latin styles today known as Salsa. It was first a music of the country people and eventually migrated to Havana, where it was urbanized and began to draw a wider audience. Guitarist Paul D’Alessio, a simple-living country man himself, came into contact with this music on a trip to Cuba in 2004 with the Brunswick-Trinidad Sister City Association, a cooperative between Brunswick, ME and the city of Trinidad, Cuba. He began learning to play Son music on a guitar-like instrument native to Cuba called the tres and subsequently formed Primo Cubano, “Cuban Cousin”. Trumpeter Marc Chillemi has also spent time in Cuba and has played in various other Latin groups. He also plays percussion and sings on the choruses, or coros, to which the lead singer, or sonero responds with an improvised lyric. Lenny Hatch has loved the congas since he first heard Mongo Santamaría play Watermelon, and he has been playing them in addition to the bongó and other percussion instruments for over 20 years now. Eric Winter has been singing all his life and began studying Spanish at the age of 12. He has become particularly interested in Cuban music in the last few years. Eric also plays maracas and is the newest addition to Primo Cubano. Keeping it all together is Duane Edwards on the bass fiddle. He is a graduate of the University of Maine at Augusta and plays in various groups in the area. As a jazz student, he took very quickly to the tumbao bass pattern that makes this music so danceable. For a taste of their music, click HERE. Admission: $15. General Admission Tickets will be available in advance at the Rangeley Chamber of Commerce, 6 Park Rd, Rangeley, or call them at 207-864-5571. Tickets will also be available at the door.